She aslo emailed me personally and asked that I share this. 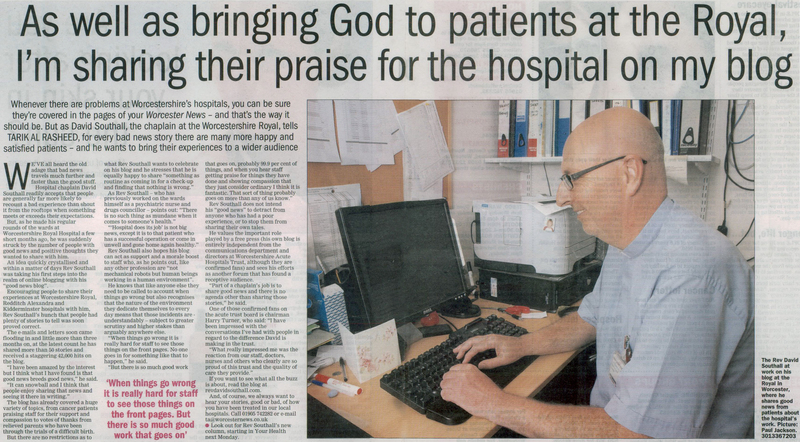 “I very much enjoyed reading the article in yesterday’s Worcester News about you and your “Good News” blog from Worcestershire Hospitals by Tarik Al Rasheed on Monday 29th July. This article in the paper was very timely for me as I would like to say a huge thank you to Jane Brassington and her team at the Early Pregnancy Unit (EPU) at the Worcestershire Royal Hospital. I am four months pregnant and after a series of miscarriages over the years this is the furthest I’ve gone and the department’s care was exemplary. I was offered scans at 6, 8 and 10 weeks prior to my official 12 week scan to ensure that all was going well with my pregnancy along with regular check-ups, and was able to call any time and speak to a nurse or midwife with any concerns or queries I had, no matter how small they were. I also had excellent care after suffering 6 miscarriages, including masses of tests to try and find out the cause and they couldn’t find anything wrong with me. My first husband and I then separated and divorced last year. I remarried in April this year to a wonderful man Russell, this is our first pregnancy together and it has gone swimmingly so far. We are ecstatic about the baby and can’t wait to be parents, God really does grant miracles as I honestly thought I would never be a mother. As the article in the Worcester News states we hear such horror stories about mistakes and blunders in our hospitals and NHS system that it is all too easy to lose sight of the good care and treatment that patients receive, and I hope you will consider posting my “good news” story on your website. I’ve written to the Worcester News too and I’m the Director and Founder of the Worcestershire Literary Festival – http://www.worcslitfest.com. I would love to include a link to your blog on our website and write a post for our own blog and newsletter to encourage those within our circles to send in their own good news stories. Please keep up the great work you are doing with the blog. It still amazes me how readily people will share their good news stories if they are given a forum. A huge thanks to Lisa for writing so personally and honestly.And your story can appear here as well. Just email me at revdavidsouthall@aol.com or comment on this post. Good news can spread like wildfire if we let it. This entry was posted in Chaplain, EPU, Good News Blog and tagged care, good news, healthcare, Lisa Ventura, National Health Service, Tarik Alrasheed, Worcester News, worcestershire acute. Bookmark the permalink. Great to hear from you Nick. And thanks for the encouragement. Blessings for 29th.